By the end of the 30-year-old film classic Back to the Future Dr. Emmett "Doc" Brown persuades buddy Marty McFly and Marty's girlfriend Jennifer Parker to join him in his flying DeLorean time machine to help their future children. The day they arrive (in film two) is October 21, 2015. So MIT professors thought it made sense to use Back to the Future as the theme for this year's annual competition that marks the end of their mechanical engineering course 2.007 (design and manufacturing). 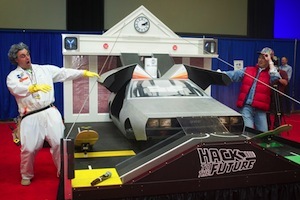 "Hack to the Future," as the contest was called, invited students to create robotics that could open the DeLorean's doors, throw bananas into Mr. Fusion to power the car, punch a big red button to stop time on the clock tower and save Doc Brown by helping him zip-line down the tower. Students pursued multiple strategies to ratchet up the points in each stage, but in the end slow and steady won the race. 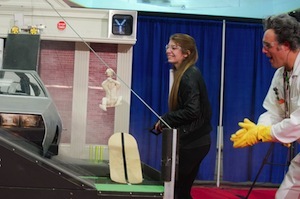 The winning robot, "Rafiki," was built by Allison Edwards, a sophomore majoring in mechanical engineering. Her design — as well as the one by runner-up junior mechanical engineering major Yamile Pariente — used a single machine to handle each task. However, other students took a multi-robot approach, each one designed to carry out various tasks. For example, one high scorer, mechanical engineering junior Amado Antonini, built a robot called "Catfish" that performed a single task — riding up and down a cable carrying a runner (Doc) from the starting box to the clock tower. For each round trip, the robot scored points. The approach failed, however, when the robot got tangled up with a dangling string at the top of the tower. Another student used a five-foot scissor jack-like structure to drive to the base of the clock tower in order to pitch its banana payload into a receptacle. But a bad angle sent the bananas flying in directions other than the target. As MIT writer David Chandler noted, "Many robots failed, despite their clever designs, when a slight misalignment caused them to tumble off the side of a ramp, flip over backward on a steep slope, or burn out a motor or strip gears while racing to score points — teaching students significant lessons about design, balance, torque, material properties and the vagaries of luck." Consistency of performance eventually sent Edwards to the top of the scoreboard. As Sangbae Kim, an assistant professor of mechanical engineering and one of the class's instructors, noted, "The last two years in a row, very steady and reliable designs have won." "Most students think this is one of the most memorable classes they take," said Kim, who dressed as character Marty McFly for the event. Accepting her award, Edwards said of her classmates, "You build amazing robots. You should all be very proud."